LESSON 1: What's at the End? LESSON 3: Crabs are where itâs at! LESSON 8: Birds and People Have What in Common? Crabs are where itâs at! Students will be able to recognize and write the blend /cr/ as part of practicing grade level phonics. Sorting picture items helps the students begin to recognize the blend /cr/, which helps build fluency when reading. I select a student who is raising their hand to respond to the question. I select two or three more students to respond to the question. I use the PebbleGo website to give my students an introduction into the physical features that make up a crab, its habitat and its life cycle. The interactive multimedia activity will help the students increase their vocabulary and gives them background information on crabs. During reading we stop and discuss the illustrations and descriptions of the animals. We compare and contrast what we would see in nature and what we see in the book. For example, the egret wearing a hat and having spectacles, the Canadian goose with his beret and scarf, etc. When I have finished reading the book I tell the students to take a seat around the edge of the rug. Edge of the Rug Song. I select a student with their hand raised to respond to the question. I allow the class to make the sound as one. I select enough students to respond to cover all of the resources the students can use. “Table number one let’s go have some /cr/ blend sorting fun. Blending is a skill easily overlooked. As proficient readers we already ‘know’ the entire word and can easily break sounds apart and effortlessly put the word together again. Since it is effortless for us we often fail to recognize the difficulty beginners face in combining individual sounds to form words. Beginner readers do not ‘know’ the end result (the word). Therefore, choppy segmenting of sounds can prevent them from being able to combine sounds together and form the word. To read proficiently, the student needs to learn to blend individual sounds smoothly together into words without choppy pauses between the sounds. The ability to seamlessly combine individual sounds together into the fluid word is not only vital for developing correct phonologic processing, it is also critical for developing eventual fluency. Recognizing consonant blends leads to smooth blending which is one of the sub-skills vital to developing correct phonologic processing, the foundation for proficient reading. To avoid potential difficulty it is important to directly teach smooth blending skills from the beginning. The student needs to automatically engrain the skill of smooth blending. Also remember, it is always easier to develop correct techniques in the initial stages then try to ‘undo’ engrained bad habits of ‘choppy’ ‘segmented’ sounding out. Take the time to develop smooth blending from the very beginning. Once the students are seated I tell them that their exit slip for today is to tell me a word which has the blend /cr/ as its initial sound. Once a student has told me his/her /cr/ word they are able to use the hand sanitizer and go to get their snack. If a student is unable to give me an answer, they know they can do one of two things. They can wait until everyone else has gone and then we will work on coming up with a /cr/ blend word together. Using this easy formative assessment tool gives me an opportunity to see if a student can quickly recall the skill they just used to complete the activity. They have just practiced using their phonetic abilities during the activity so it should not be difficult for the students to respond to this request. However, if a student does have a hard time coming up with a response I will take note because I need to find out if the student had difficulty because he/she has trouble transferring skill use from one activity to another or perhaps he/she was copying peer work at the table and does not have the skill themselves. Knowing the answer to this question will determine how I handle the situation. I use the checklist to go over the student’s work and once it is complete I will place the student’s work in his/her collection portfolio. Looking at the student’s work with the Cr Blend Sort Checklist helps me to stay focused on the point that I am looking to see if a student can differentiate between a blend and an initial sound. For example a student may select to put the image of a cake onto the /cr/ recording sheet. This shows me they can isolate the initial sound, but they need more practice at identifying blends as a pair of letters which make a specific sound. Make a paper plate Atlantic Blue Crab for display on our bulletin board. 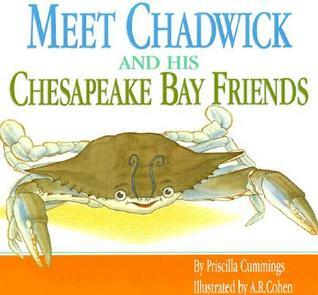 Students could write a story about Chadwick and one of his friends, or the students could write about which Chesapeake Bay friend they like best.